Earlier this week, the Oregon Building Codes Division announced a statement of alternate method (SAM) that makes Oregon the first state to allow for construction of wooden high-rises without special consideration. Previously, Portland, Ore., was the first American city to issue a permit for an all-wood high-rise, Project’s 12-story-tall Framework. Under the SAM, there are three new types of wooden building under the pre-existing category of “Type IV heavy timber construction.” Type IV A structures can be built as tall as 18 stories/270 feet and must encapsulate any exposed timber surfaces and meet a three-hour fire-resistance rating for the structural elements. Type IV B structures can be built as tall as 12 stories/180 feet. 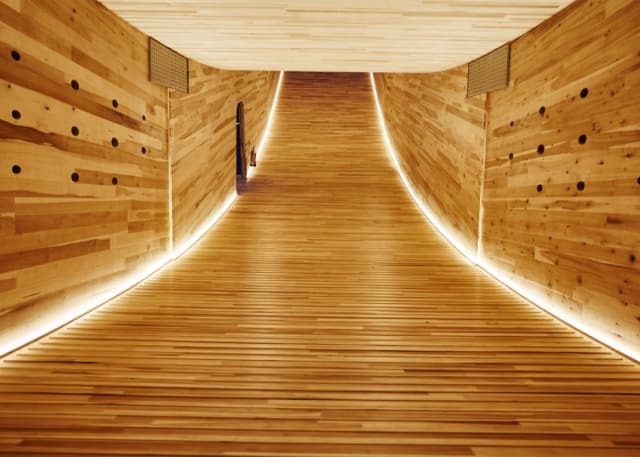 A percentage of the wood, calculated using occupancy and use, can have exposed timber surfaces. The Type B needs to have structural elements with a fire-resistance-rating of two hours. Finally, Type IV C structures can be built as tall as nine stories/85 feet and have no limit on the amount of wooden surface that can be exposed. They also need a structural resistance of two hours. The structural guidelines have been developed for cross-laminated timber (CLT), a new building material that has advocates saying it can replace structural steel and concrete. CLT is made by layering pieces of lumber in alternating directions and bonding them into panels several layers thick, somewhat like a Jenga tower. The finished panels can be as large as 65 by 20ft and several inches thick. According to supporters of the material, the thickness of the material will help it char instead of burn during a fire, making the outer layer fire resistant. It seems the Oregon Codes Division was convinced by the material’s property and the committee’s suggestions. In their April meeting with the Codes Division, the committee made 14 suggestions about CLT standards and best-practices, all of which were accepted. While the legal barriers to wooden high-rises are falling, there are still threats to a potential wood-framed future. The construction of the much-touted Framework Tower was put on hold this July after “fluctuations in the tax credit market” and rising construction costs made the structure unprofitable. “Over the last four years, the Framework team has worked with private entities and public agencies that have understood the nature of this project and have supported our efforts to bring this pioneering model to fruition,” said Project partner Anyeley Hallova, after the announcement. Despite the setback, Hallova was encouraged by the work done by the SAM.